Blues Brothers sunglasses have mesmerized entire generation of fashion lovers since its first appearance in 1980’s. 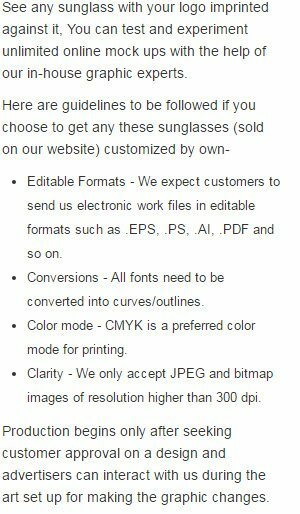 Personalized Blues Brothers sunglasses can be sought by marketers and individuals to mesmerize a generation of targeted customers and to build good business / social future for themselves. This cost friendly Blues Brother sunglass can be easily distinguished by its colored purple frames and dark lenses, which offer total UV400 protection. This one size can easily work for most adults and they can choose to team it with any casual clothing that they wear to work, party or any social event. Promotional Blues Brothers sunglasses imprinted with suitable business symbols can be gifted away during promotional events, sports events, corporate businesses, shopping events, sponsored community events, medical camps, etc. Custom Blues Brothers sunglasses will be retained for long time due to their brilliant aesthetic appeal and the eye protection that they offer. Imprint Area: 2" X 5/16".